You open the car doors with the app and lock them with it. You can start the engine once the doors are opened, but don’t wait too long to start because after a few minutes you have to press open doors again to be able to start. You start the car by pressing the brake and the start button simultaneously. And the engine is turned off by pressing the start/stop button again. Sounds simple right? And otherwise there is a manual in the car. You can also download it here… Oh yes, as long as you don’t end your rent, you can open and lock the doors as often as you like and start and stop the car as often as you like. Just when you rented a shiny Fetch car for 30 cents per minute (or less), you receive a road towing fine of € 373,- and additional costs some weeks after. Believe us, we don’t want that at all. 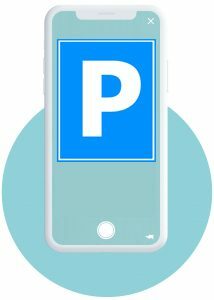 Therefore pay close attention (the app also gives you instructions) when parking. Even though our cars have a parking permit, always look at the applicable laws and regulations. In a ‘blue zone’ you use a parking disc. And don’t leave the car in a place where there is a restriction (for example the next day because there is a market). You remain responsible until the next rental. Sorry, don’t blame us for that. At a charging pole the car needs to be connected with the cable to it. No exceptions. The drop zone where you can leave your car (legally parked) can be found here.